AEM’s new line of Filter Minder gauges, takes the guesswork out of knowing if it’s time to service your air filter. AEM’s new Filter Minder gauges are an air filter service indicator. They constantly monitor airflow and the gradual increase of air filter restriction. As an air filter becomes dirty it holds much of the dirt and debris that was kept out of your engine. With this additional dirt and debris in the way the air filter gets restricted. The Filter Minder gauge senses this restriction. It’s needle displays the current condition of your air filter. When the air filter is clean and has little restriction, the needle will stay in the green section of the gauge. As the air filter moves through its service interval it will move into the yellow section. Once the Filter Minder needle reaches the red zone it’s time to service your filter and reset the Filter Minder gauge. AEM currently has three Filter Minder gauges available. The dash mounted Filter Minder gauge (part 30-5110) is designed for mounting inside the cabin of your vehicle. The dash mounted gauge includes all the necessary hardware for mounting. Ten feet of vacuum hose and bezels in silver and black are included so the gauge can be customized to match the interior of your vehicle. AEM also offers remote mounted Filter Minder gauges for easy mounting in the engine bay of your vehicle. Two remote mounted gauges are available. The 30-5111 is the standard remote mounted gauge suitable for most applications. It like part 30-5110 is designed to show a red indication at a pressure of approximately 10 inches of water. The 30-5121 remote mounted gauge is designed for heavy-duty diesel applications where a pressure drop of less than 20 inches of water is acceptable. These remote mounted systems come with all necessary hardware, including a support bracket for mounting and 36 inches of vacuum hose. 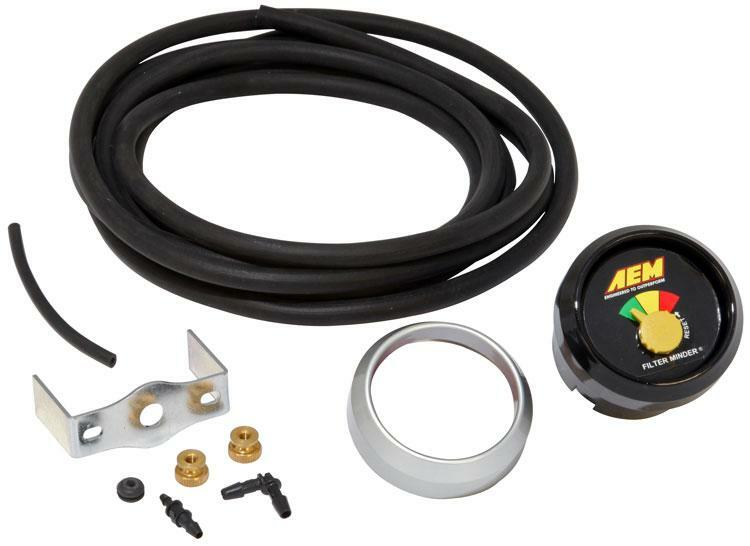 All AEM Filter Minder gauges are easily installed by tapping into a vacuum source on the lid of the air filter then connecting the vacuum hose to the back of the Filter Minder gauge. Each system comes complete with detailed installation instructions.